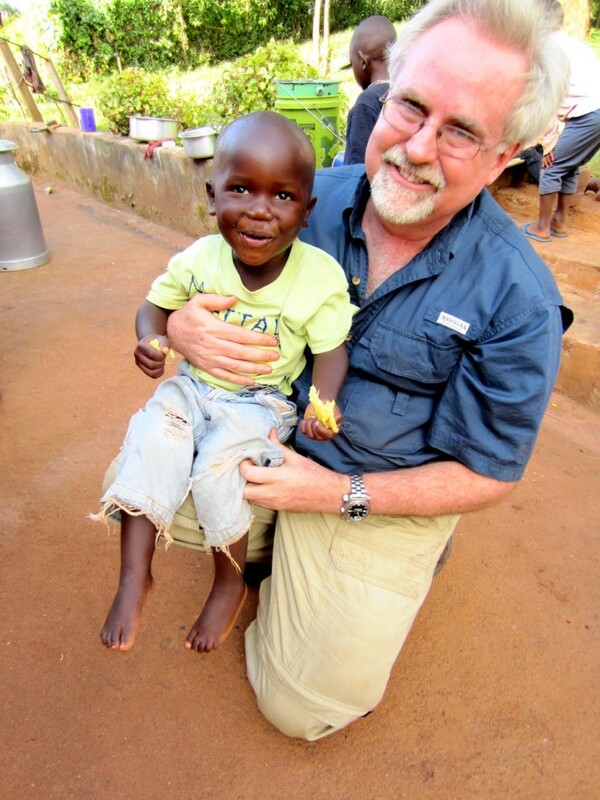 I have greatly enjoyed your videos. I find that your style with careful instruction backed with written comments is commendable. I like the fact that a usable code is included so that I have a solid start that I can experiment with and develop further. I do have a problem with “Lesson 13” in that the only RGB diodes I can get here in Copenhagen are common Anodes! and not common cathodes as used by you. Could you be so kind as to send me some suggestions as to making a substitution? Jeff, it should be almost the same only connect the common annode to +5. Then connect the three ground pins to three different arduino pins. If you pull a pin low, that one will turn on. If a pin is high, it will be off. I believe that will work. But if they are using RGB that are common Anode and trying to follow your video’s code. How could they do it with a RGB that is common Anode. The Arduino kit I bought came with a RGB common Anode led. 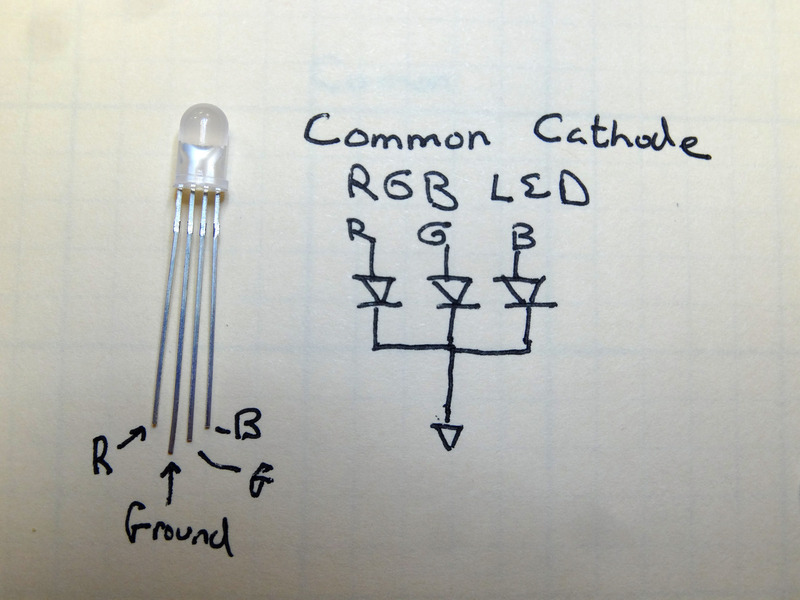 But I was lucky I also had a RGB led module that was common cathode based. Great, well done, indeed you have made most off like embedded system more and more. Great Teacher, thank you for the exceptional lessons on Arduino. I have a question. When do we use analogWrite and when do we use digitalWrite? In lesson 6, the redLedPin and the yellowLedPin were connected to analog pins 9 &10, and you used digitalWrite. In lesson 13, the RGB LED were connected to 11, 10 & 6 pins (all analog pins) and now you used analogWrite. Can you enlighten me on this, please? digitalWrite is when you want on or off. You apply 5V or 0V. The analog write uses pulse width modulation (PWM) to give you simulation of the in between values. Like low, medium, high. Not really, the ones in lesson 13 are all digital pins. the analog pins are on the other side of the board marked A0 to A5. There are two types of dgital pins those that are pwm and those that are not. PWM pins are indicated by a wavy line next to the number (3,5,6,9,10,11). All digital pins can be give a high or low value which is basically on and off. However, the PWM pins can also give an in between output 0-255. so if you have something like an led which varies in brightness and it is attached to a PWM pin (e.g. Pin 9) you can either give it a high or low command which would make it on at full brightness or completely off or else you can give it a number between 0-255 e.g. 128 which would put it on at half the brightness. Thanks for the instructions. I got it working. But why do green and blue flash but red doesn’t? I tried 220 and 1000 ohm resistors and 2 leds. Also, I think you got blue and green back to front because they were swapped and I checked that it matched your diags and LED diagram. Your videos are of great help for any projects. 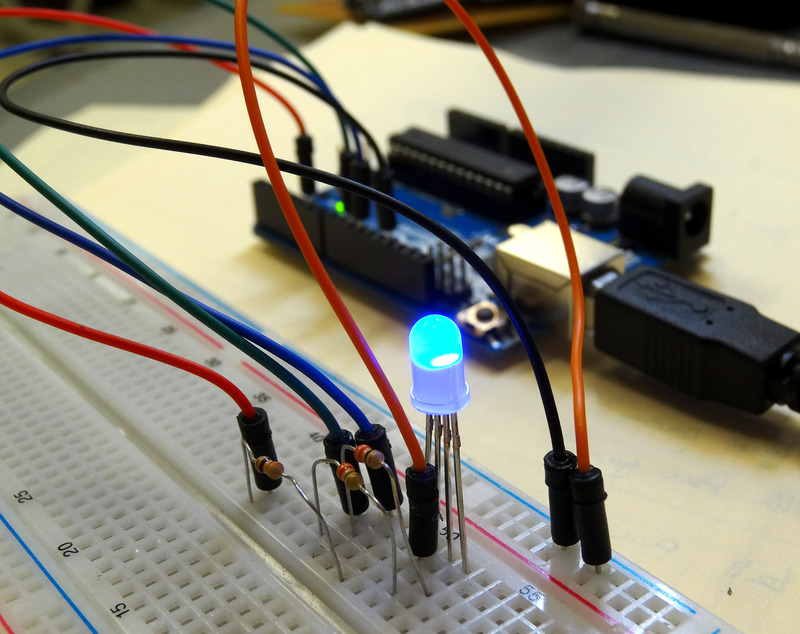 I wanted to know how can I control 20 RGB LEDs separately from a Arduino UNO. Each RGB LED requires 3 pins, but UNO has 11 digital I/O pins. I don’t need to control brightness though, so ON/OFF stages will also work. Is there a way to do that? Say, I want to give colors to these 20 LEDs according to some number. If I enter 5, 5 LEDs glow with RED color, then if I enter 2, 2 LEDs glow with GREEN color and accordingly.. Thanks a lot for your help. Arljlt – I find the easiest way to control a large number of multicolored LEDs is to use Neopixels (I bought mine from Adafruit). They are individually addressable LEDs (WS2812 LEDs). It sets the LED color via a data signal so it uses only 1 pin on the arduino (plus you need to power the lights of course). They are very cool. It would be very easy to do what you are requesting with neopixels. Your videos are well managed and very much informative. I got just one quick question regarding user inputs. There is two different results the compiler throws out. Situation 1. Colour choice before while loops. When this is done, when running program, at first no matter what right colour choose red, green or yellow, compiler throws out choice is invalid as if we chose wrong colour. Another thing, you have to two types for eg, choice red and again red to make changes. Situation 2 is opposite of situation one. while loop before user input. I think it is compiler related problems but I find it very interesting and can not understand how it is doing it. Please shed some light on it. hi, these lesson are by far best to learn about Arduino and you are really a very nice teacher. I want to know about how can i use common anode RGB LED ? i just need the circuit diagram and source code. I googled for it and find some, but they are too complicated. sir, if you don’t mind plz improve it by using the values of different color from paint and apply here to display different colors accordingly. Please give proper instruction for common anode rgb . its not working. Hi, I work on a project in which i have to read string from an external server to arduino. The request from server contain a group of characters (L=On) with what i would like to turn a led On. The problem is, the request come with informations about the server (Glassfish…. content lenght….). I don’t know how to capture the only information i need. In lesson 13 you wrote this direction for wiring up the rgb LED. 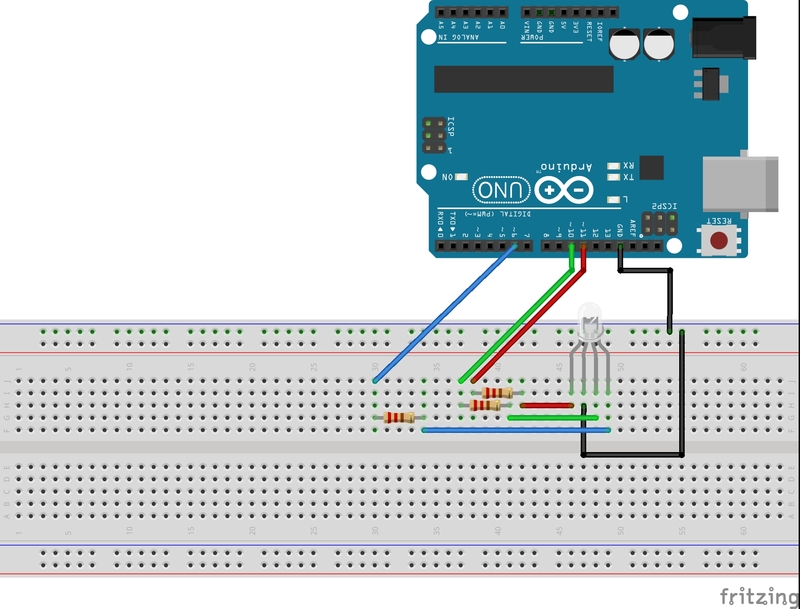 ” The following schematic controls red from arduino pin 6, green from arduino pin 10 and blue from arduino pin 11. Go ahead and hook this circuit up.”. The program and the drawn out wiring diagram show the red and the blue LED reversed. I don’t know if anyone has pointed this out, but I noticed it immediately when wiring up this lesson. I am enjoying and learning a lot of good stuff from this site,and i’ve been making beautiful projects based on this knowledge ,i would like to provide an easement in the circuit ,instead of using three resistor you can use one resistor on cathode pin ,it is just a suggestion ,am i write? NO! You must have three resistors. You have to think of this as three seperate LED.